Everyone loves a bargain, especially when it comes to a product like facial moisturizer that can sometimes cost more than $100. Moisturizers are important to a skincare regimen because they provide hydration and protection, but depending on the ingredients, you can spend a small fortune for a "good" moisturizer. Some of the most popular face moisturizers actually cost around the same amount as a White Chocolate Mocha and have the same perks (some are even better!). 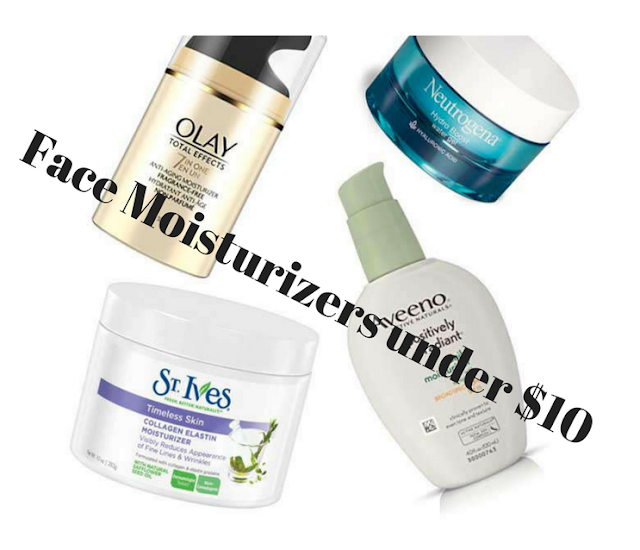 Here are some great moisturizers for $10 that have hydrating properties, fast absorption, a non-greasy texture and most importantly, results. This moisturizer uses 97% naturally derived ingredients like Vitamins B, C, and E, and antioxidant omega bionutrients. It is the perfect product for oily and combination skin and helps prevent breakouts while hydrating skin without leaving a sticky, oily residue. I’ve always been a fan of Nivea products! I love that I can use this multitasking product on both my body and face. It smells great, moisturizes well and absorbs quickly. It really helps areas with dry patches like elbows and behind knees and is ridiculously affordable. Although it’s not exactly a moisutizer, I love using Jojoba Oil. It's a moisturizing oil, a cleanser and makeup remover - it's extremely versatile and hydrates your skin and hair. Even a few drops of the oil will help acne prone skin to help clear up flare-ups. This is a light cream uses 100% vegetarian ingredients like aloe, green tea antioxidants and refining humectants. It lightly replenishes and moisturizes the skin. No animal testing and no parabens, phthalates, or synthetic fragrances. It feels luxurious without being greasy or too heavy. This is a moisturizing soufflé lotion that leaves skin soft and smooth. It has soothing Oatmeal, Shea and Cocoa butter and is loaded with antioxidants to help restore skin's moisture barrier and helps prevent and protect dry skin. This is another multitasking lotion that can be used for the face and body.